So, Kim’s parents gave us tickets to the Summerfolk folk music festival in Owen Sound last weekend, and man, what a great show. We got to see Colin Linden, the ever awesome Danny Michel, and one of my personal favourites, Sarah Harmer (who I got to nervously say hello to after the show!). I’ll have more from the show later, but for now, enjoy this one I snapped while watching The Human Statues. 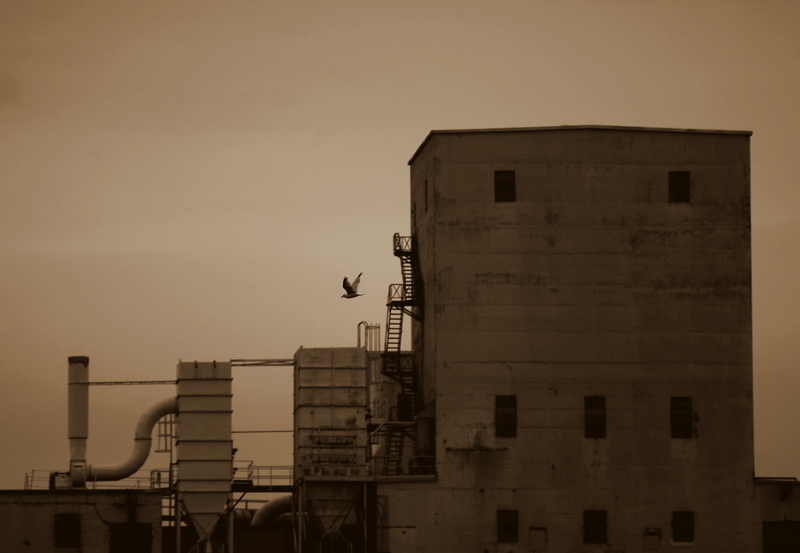 The scene is a sea gull soaring past the Owen Sound grain elevator. P.S. I stongly recommed clicking on the names above for some awesome music. This entry was posted in Architecture and Design, Birds, Music. Bookmark the permalink. That’s a fine sepia shot.